I have been told many times that I look like various different celebrities. I have heard Kerri Russel, Catherine Heigle, Jessica Simpson, Heidi Klum, and Charlize Theron. These complements would normally come randomly and it is always nice to hear, since all these woman are gorgeous. Well, last night I went to Barnes and Nobel to buy a few books and the guy who rang me up said, "Has anyone ever told you that you look like Charlize Theron?" I politely said yes and thanked him for the complement. 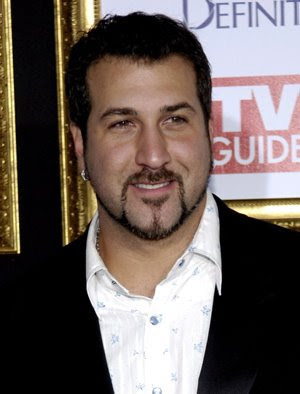 Well, tonight Nathan and I decided to go out to dinner and while waiting to be seated, I told Nathan the aforementioned story and we started discussing how people tell Nathan he looks like Joey Fatone from N'Sync. Shortly after we were seated. After we sat down and the waiter took our drink orders, he turned to me and said, "Has anyone ever told you that you look like Charlize Theron?" I of course giggled and said yes, and that it actually was the second time in 2 days. I thanked him for the compliment and he was off to bring us our drinks. When he returned he turned to Nathan and said, "And you know who you look like? Joey Fatone from that group." We were all giggles again, it was pretty ironic because we had just been talking abo ut this. The waiter then joked and said he is going to tell people he is waiting on celebrities. At the end of the meal when we were ready to leave the waited called out "See you in the movies!" I just thought that was it was funny! I bet with your short blonde hair it makes you look even more like her because she usually has hers that way. Well...enjoy your couple celebrity status! That's so funny...I never thought of Joey Fatone for Nathan, but it's so true! Every time I think of Keri Russell I think of you, even though you don't have the same curly hair anymore! But you so looked exactly alike when you were younger...you're B-E-A-utiful! hahaha. i love funny things like that...coincidental things where your just like "OH MY gosh--crasy!" funny you got that complement twice and then the waiter totally pointed out what you guys were thinking. funny! you should have had a picture of yourself that day so i could see if you really did look specifically like Sharlise (no idea how to spell that) Therone. But cute story. You don't look anything like them. You actually look more like one of my friends...who doesn't look like any of them. I'd write that up as a great compliments!